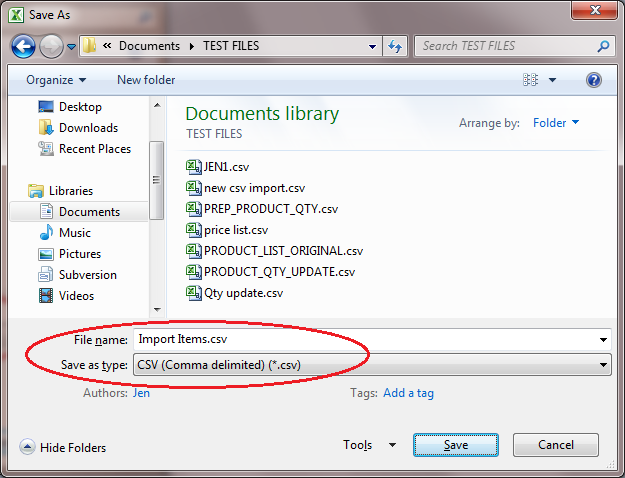 Files can be stored as a CSV by selecting this format when saving. Open your spreadsheet file (typically a ".xls" file) in your spreadsheet program (e.g. Excel). Go to File > Save as . Choose the type as a CSV. Click save and check the newly created file has a ".csv" extension. If you are using windows you may have to enable the display of 'file extensions for known file types'. You can then import this file into Brightpearl. Macs produce CSV files in several different formats, non of which currently import successfully to Brightpearl. In order to import your files all you need to do is upload it to GoogleDocs then download it again. This will give the file all the necessary hidden data required by Brightpearl to read it when it is imported.